Vice Adm. William H. McRaven helped to devise the strategy for how to bring down Osama bin Laden, and commanded the courageous U.S. military unit that carried it out on May 1, 2011, ending one of the greatest manhunts in history. In Spec Ops, a well-organized and deeply researched study, McRaven analyzes eight classic special operations. Six are from WWII: the German commando raid on the Belgian fort Eben Emael (1940); the Italian torpedo attack on the Alexandria harbor (1941); the British commando raid on Nazaire, France (1942); the German glider rescue of Benito Mussolini (1943); the British midget-submarine attack on the Tirpitz (1943); and the U.S. Ranger rescue mission at the Cabanatuan POW camp in the Philippines (1945). The two post-WWII examples are the U.S. Army raid on the Son Tay POW camp in North Vietnam (1970) and the Israeli rescue of the skyjacked hostages in Entebbe, Uganda (1976). McRaven—who commands a U.S. Navy SEAL team—pinpoints six essential principles of “spec ops” success: simplicity, security, repetition, surprise, speed and purpose. For each of the case studies, he provides political and military context, a meticulous reconstruction of the mission itself and an analysis of the operation in relation to his six principles. 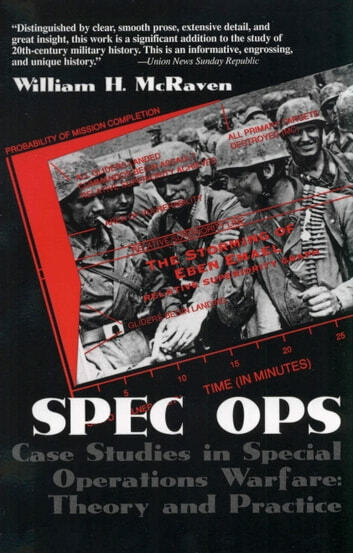 McRaven deems the Son Tay raid “the best modern example of a successful spec op [which] should be considered textbook material for future missions.” His own book is an instructive textbook that will be closely studied by students of the military arts. Maps, photos.